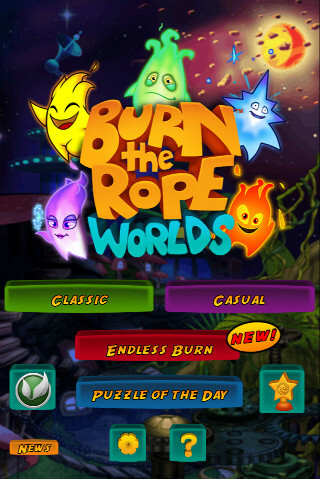 Burn the Rope Worlds is a great little iPhone game, and a sequel to the original Burn the Rope app by Big Blue Bubble. The idea here is that a rope must be burned by the flame which you control. It actually sounds simple and is easy to pick up, but very difficult to master, especially later levels. As with a real flame, it can only burn upwards, so you have to make sure that you keep it pointing in the right direction by literally rotating the iPhone. If you don’t manage to keep the flame burning along the rope for whatever reason it will just fizzle out. Using the built in accelerometer the developers have managed to produce a game that puts it to good use, and with good accuracy. The game also features little critters that you have to burn along the way, the flame then takes the color of that critter – in more advanced levels you have to have a flame that matches the color of the rope you want to burn, not easy. The graphics are good, with a nice blend of color variations and comically cute characters. The animation is reasonably good as well. The main theme music sounds like something out of an old ’80’s TV program – Its kinda funny in that way, but can wear a little thin. 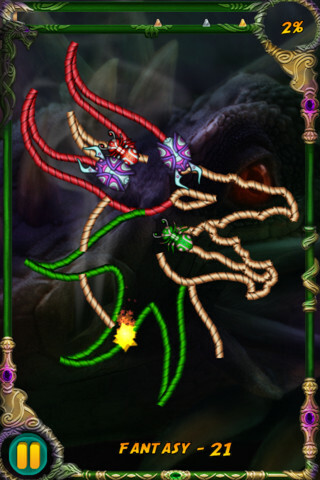 The rope patterns have been cleverly designed, and because you can start your flame anywhere on the rope you can play the game levels a few times with different approaches. The game offers achievements, OpenFeint integration and an endless burn game which is basically an old fashion snake game where you cant bump into your own growing burn trail or into walls. Burn the Rope Worlds currently sells for $0.99, and at that price I recommend you give it a try if you are looking for something different – But if you aren’t up for a good challenge then this one may frustrate you. AppSafari review of Burn the Rope Worlds was written by Richard Best on September 16th, 2011 and categorized under Action, App Store, Fun, Games, Physics Based, Puzzler. Page viewed 5727 times, 1 so far today. Need help on using these apps? Please read the Help Page.